Brand new for 2018 is the wonderful Acaya Golf Resort near Lecce, Italy. This wonderful four star hotel offers us a relaxing yet luxurious stay in the heart of the Italian countryside. This wonderful course is originally designed by renowned architect David Mezzacone. However in 2009 the course was revamped by Michael Hurdzan and Dana Fry one of the most prestigious names in the golf world known for their environmentally approach to golf. 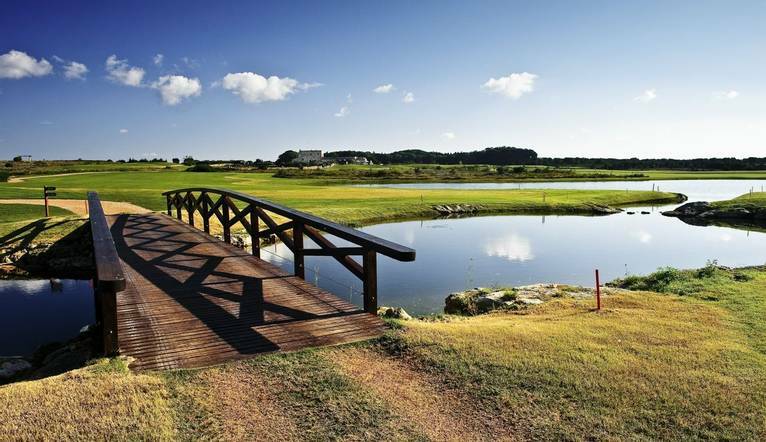 Located close to the hotel it lies in a nature reserve with many a water hazard! On our non-golfing days, we can explore further afield with a range of optional excursions, look forward to discovering beautiful Lecce, where in addition to the abundant Apulian Baroque architecture we may visit a papier-maché factory for which Lecce is well known. Or perhaps we could discover Otranto, a sea side small town known for its Norman Cathedral and the largest mosaic in Europe “The Tree of Life” (subject to availability and minimum numbers apply). Or, if you would prefer to relax and unwind, then we can make full use of hotels very well-equipped spa facilities. Located in Puglia between the Adriatic and Ionian Sea and near to the historic towns of Lecce and Acaya lies our wonderful four star hotel. The hotel and golf course are nestled in a wetland preserve which ensures us a relaxing and comfortable stay. Hotel facilities include a 1200m2 spa with extensive wellbeing facilities which include Jacuzzi, sauna, steam bath, frigidarium, tepidarium, sensory shower, relaxation area and complimentary pack with fluffy bathrobes and towels. Treatments such as massage and beauty treatments are available. Please be advised that additional charges may apply. Other facilities include 2 outdoor pools, 2 restaurants and a pool bar. Room facilities include a king sized bed, a terrace or balcony with views over the garden or golf course, LCD TV, tea and coffee making facilities, air conditioning and DVD player. Free Wi-Fi is available throughout the hotel. The transfer time from Bari Airport to the hotel is approximately 2 hours, depending on weather and traffic.